This is the same versatile wood plyo box utilized in CrossFit Games competition, with a 3-in-1 design straight from the event’s own specs. American-made, battle tested, and backed by a year-long warranty, this is a jump box built for safe, effective plyometric training at any skill level. Add a Games Box to a garage gym for a new workout dynamic or order in bulk to equip or upgrade a large scale strength and conditioning facility. 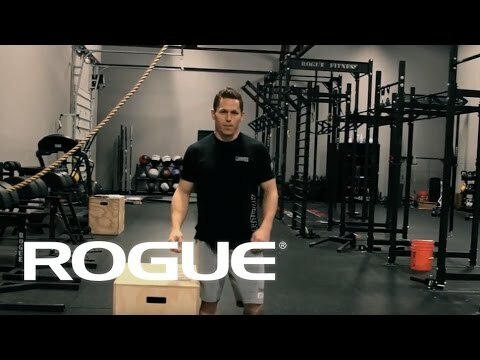 See Also: The full line of Rogue Plyo Boxes . Height Options: 20", 24", 30"
All wood plyoboxes have a 1 year warranty. Rogue Games Box is rated 4.9 out of 5 by 35. Rated 5 out of 5 by Epeyens from Solid Had these for a few years now and used them a lot. They are still as solid as the day we got them. Very happy. Rated 5 out of 5 by Royals from Well Built!! I bought this about a month ago and it has been great!! Rated 5 out of 5 by BDoubleUB from WODwork instead of WOODwork I considered buying the DIY version to save some money but the already assembled box was the right choice for me. I pulled it right out of the box and started jumping on it. Might still be in a pile somewhere if I had to put it together. No need to discuss the quality here either...its a Rogue! Rated 5 out of 5 by BT51 from Another awesome product I've purchased a few products from Rogue, this box and everything else is top quality. You get what you pay for. Rated 5 out of 5 by Kdarby13 from It’s amazing!! Love the rogue box jump they are super quick with shipping and shipping Ian outrages either! Rated 5 out of 5 by AmyW from best gift I've given my husband! I LOVED the idea when it came to me - and my husband LOVES his new box! I use your boxes at Sunstone Fitness in Keller and Southlake Texas, but my husband works out at home - and this elevated his morning experience! Rated 5 out of 5 by billyaustin from Really dolid Very happy with this box. Really well constructed. Rated 5 out of 5 by Mikeanthony478 from Just read the review. Freakin’ awesome. Worth every dollar. Went with a cheaper knock off version of a box the first time and it was a complete waste of money. The Rogue box is solid and durable. I’m 6’1 250lbs and this thing is sturdy as can be, doesn’t move or wobble at all. 100% satisfied.